It was a slow weekend for us on the betting platform because we were mostly done in by public choices. The one we wanted, the beast of pacing, Captaintreacherous, put in a dynamic performance to win a North America Cup elim. 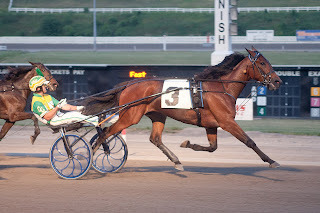 He was challenged in the stretch and met that by dismissing the challenger and pacing to a win in 1:48.4. We were second with second-choice Odds On Equuleus in another elim (won by the top betting choice, Vegas Vacation) and third with Martini Hanover, in the other elim (won by a 5-2 co-favorite). “Martini” was more than 20-1. Also in the mix of an Armbro Flight elim, our 30-1 Bax Of Life made the final, finishing third. We lost the other elim with Dorsay, who made a good front-trotting effort to three-quarters at 13-1, to the public choice, Maven. The sole Fan Hanover elim was won by another big choice, I Luv The Nitelife, though our choice, Parlee Beach, finishing eighth, made next week’s final. Blueridgevalentino was second to the favorite, paying $15.60 to place and combining for a $48.60 exacta. Meadows H2W horses will be updated here as six go to post on June 10. Two-year-olds continue to tune up for the 2013 racing season. The Meadowlands hosted baby races Saturday, June 8 and a herd of youngsters took to the limestone. Here is a treated report we received from Nick Salvi at the baby-race program to help you keep an eye on freshmen coming to post soon. A sharp trotting colt named Jetta Liner from the first crop of Pennsylvania sire Lear Jetta impressed a lot of people. The colt led all the way to win. Paul Reid trains. 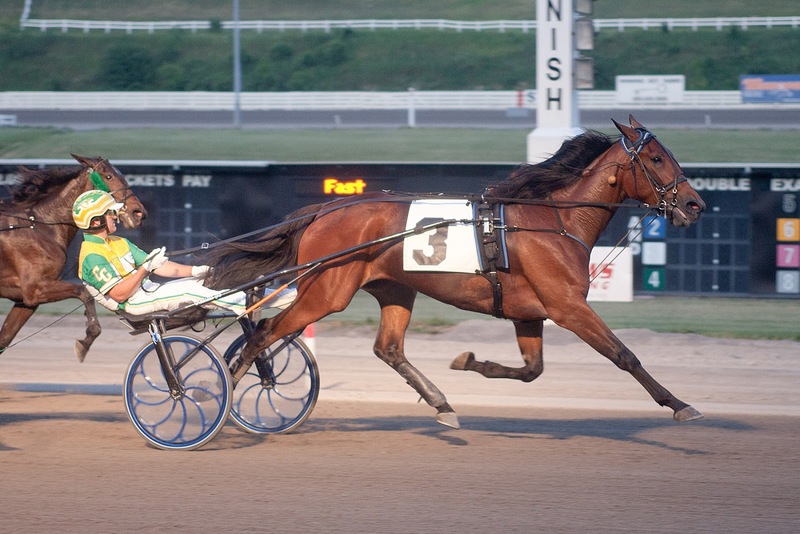 The mating of 2009-Hambo-winner Muscle Hill and 2008-Hambo Oaks-winner Creamy Mimi resulted in a colt named King City, who won after showing a quick turn of foot, looping the short field to win for trainer Jonas Czernyson. Another mating of note was Nicole Kraft to sire Ken Warkentin. This cross has resulted in the small filly, Love Detective, who scooted home to win. Jimmy Takter. Other trotting winners included Muscle Hill-filly Pacific Winds K (Paul Reid trains), Cooler Schooner, full sister to 2009 Hambo Oaks winner Broadway Schooner (Jim Campbell trains), Expressive Action (John Grasso trains), Musclesprinctonian, from Broadway Schooner and sire Muscle Hill (Jim Campbell trains), The Lindy Treaty, a full brother to Pizza Dolce (Ray Schnittker trains). The pacers impressing included Schnittker’s Art Major filly, Hay Stacked, Ali Blue (an American Ideal filly trained by Takter), Western Ideal filly My Lady Day (Joe Holloway trains), American Ideal colt Bakersfield (Takter trains), Always A Virgin-sired Always B Miki with an impressive front-pacing effor (Holloway trains), Maxi Bon, sprinting home in :26.4 (Tony Alagna trains) and Tellitlikeitis, a Well Said first cropper from Kikikatie for Team Takter. A joint venture of Churchill Downs Inc. and Delaware North Cos. Gaming & Entertainment plans to open its Ohio racino in December. VP/CFO Bill Mudd said the project is a $272-million investment. The track, for harness racing, is under construction. It will include a five-eighths-mile oval. Louisville-based Churchill currently operates casino-style gaming at its racetracks in New Orleans and Miami and at two facilities in Mississippi. Trainer Dustin Jones is talking about the 2013 Hambletonian Winterbook favorite, Wheeling N Dealin, undefeated at two and unraced so far at three. There have been three undefeated freshman trotters in the past 11 years with serious Hambletonian aspirations—Broadway Hall, Cantab Hall and Dewycheatumnhowe—and only “Dewey” kept his string alive, becoming the first undefeated Hambletonian winner. He won in 2008, making his streak 15 in a row. “Wheeling” ended his frosh winning streak with a Breeders Crown victory at Woodbine.